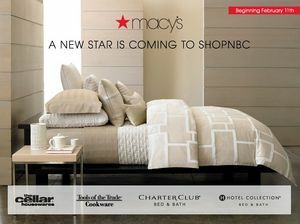 Here’s a new one on us: Macy’s is going to be selling home merchandise on ShopNBC. On Tuesday the home shopping network announced that the retailer’s home products will premiere on the channel beginning Feb. 11 at 7 p.m. Through this initiative, a select assortment of Macy’s exclusive private brands will, for the first time, be offered to a television viewing audience. and holiday traditions in cities across the country. and every customer to create unforgettable moments. Here are the private label goods that Macy’s will be hawking. The descriptions are ShopNBC’s. — Hotel Collection – Evokes the cool, clean-lined style of a world-class hotel or spa and offers a sophisticated collection of fine-quality bedding and bath elements. Premiering February 11th at 7 p.m. on ShopNBC. — Tools of the Trade – High-quality, high-performance cookware and cutlery collection that has been providing smart style, advanced technology and real value for more than 20 years. Premiering Feb. 12 at 2 p.m. and 7 p.m. on ShopNBC. — The Cellar – Inspired by the latest trends in casual entertaining, this collection offers up-to-date tableware and decorative housewares that address the needs of today’s families. Premiering Feb. 12 at 7 p.m. on ShopNBC. — Charter Club – Classic, all-American style home goods that provide the essentials for elegant, traditional decor with timeless bedding and bath elements. Premiering Feb. 20 at 8 p.m. on ShopNBC. they want to shop,” Timothy Adams, Macy’s chief private brand officer, said in a canned statement. And here’s what big Bob Ayd, ShopNBC’s president, had to say. Macy’s, the largest retail brand of Macy’s Inc.,delivers fashion and affordable luxury to customers at more than 800 locations in 45 states, the District of Columbia, Puerto Rico and Guam. Macy’s stores and macys.com offer distinctive assortments including the most desired family of exclusive and fashion brands for him, her and home. Macy’s is known for such epic events as Macy’s 4th of July Fireworks and the Macy’s Thanksgiving Day Parade, as well as spectacular fashion shows, culinary events, flower shows and celebrity appearances. Building on a 150-year tradition, Macy’s helps strengthen communities by supporting local and national charities that make a difference in the lives of our customers. 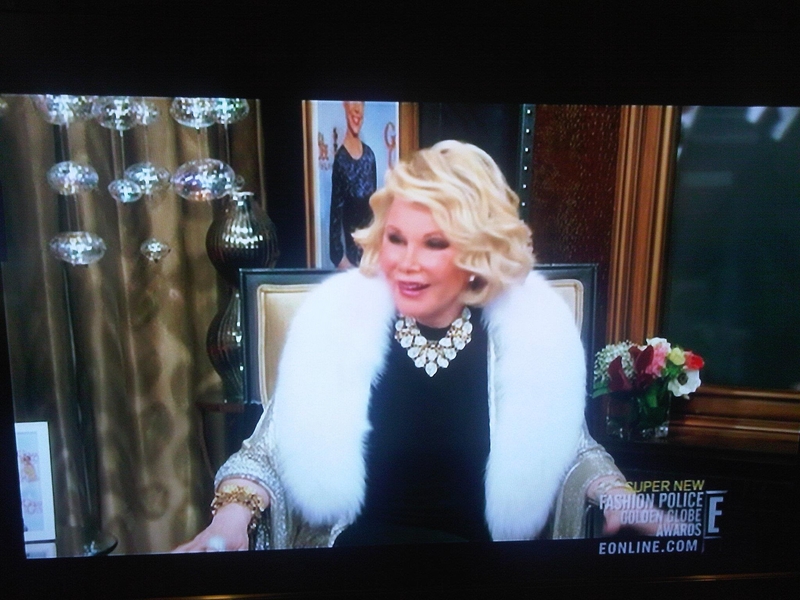 We watched the “Fashion Police” edition on the Golden Globes, and were drawling over the gorgeous necklace Joan Rivers had on, wondering if it was one of her QVC pieces. We got our answer today on Facebook, when Rivers confirmed our suspicions. She reposted a photo of her on the E! Entertainment show saying that the simulated-druzy necklace she was wearing was from her QVC Line. The necklace was on the air tonight. It is the Joan Rivers Simulated Drusy Bib 18″ Necklace w/ 3″ extender, $100, item number J267155. It comes in four colors, blue, gold, pink and silver. The silver version, the one that Rivers wore on “Fashion Police,” is on waitlist. All the necklaces are on advance order, coming in March. Lopez fans can go to http://www.hsn.com/mariolopez and leave Facebook messages for the television star and be alerted when The Solution becomes available for purchase. Customers will receive the Mario Lopez workout DVD with Mario’s two-Minute Ab Shredder workout, plus four bonus workouts. The bundle also includes Mario’s two-week Ab Meltdown Eating Guide and two-day Jumpstart and instructional guide including a seven-step easy assembly and exercise videos. Manufactured by Body By Jake, The Solution features a patented Gravitational Linkage System that takes users through the perfect synchronized abdominal motion, while the contoured Free Flow Swivel seat provides a seamless transition from scissor crunches, to right and left obliques — all while providing firm back support. Upright handgrips also open up the abdominal cage to provide the deepest, ab-ripping contraction possible. We know that we’d like to connect with him. A man of many trades, Mario Lopez has the overwhelming desire to always keep active. He is the single host of the nationally syndicated daily show EXTRA. Concurrently, Lopez continues his hosting duties on MTV highly rated program, America’s Best Dance Crew. Not only does Lopez have a proclivity for the entertainment industry, he is also an avid sports fan. He has taken his love for sports, specifically boxing, to the next level as a recurring commentator on HBO Boxing. Lopez is a New York Times bestselling author for his healthy eating guide Extra Lean. In May 2011, he released the follow up to Extra Lean entitled Extra Lean Family. This new book featured recipes and tips that are beneficial to the entire family. Additionally, Lopez penned Mario Lopez’s Knockout Fitness a bestselling fitness book that offers readers a look into his impressive workout regime, and Mud Tacos, a vibrant children’s’ book he co-authored with his sister Marissa. As a follow up to Mud Tacos, on September 14, 2011 Lopez released Mario & Baby Gia, a children’s book he wrote for his daughter, Gia. Mario was named the Alumni Ambassador of Fitness by the Boys & Girls Clubs of America (BGCA), while joining the ranks of some 25 other prominent alumni, including Denzel Washington and President Clinton, in the organization’s BE GREAT campaign. Mario will help bring to light the major issues affecting today’s young people, including the importance of graduating from high school and maintaining a healthy lifestyle and the key role community-based organizations like Boys & Girls Clubs play in the positive development of children. A popular guest on the talk show circuit, Mario can regularly be seen on programs such as The Ellen DeGeneres Show, Lopez Tonight with George Lopez, and a slew of other nationally syndicated shows. Mario is also often called upon to co-host some of the nation’s most venerable morning shows including The Today Show, Good Morning America, and Regis & Kelly. Even with all his other ventures, Mario is still in love with acting. Lopez reincarnated his guest starring role as Dr. Mike Hamoui on the final season of F/X network’s popular show Nip/Tuck. Lopez’s run on the series garnished an instant and well deserved cult following. He previously starred in the highest rated program in ABC Family history, Holiday in Handcuffs. He also starred opposite Mark Consuelos in the made for TV movie Husband for Hire, which was the most watched program ever on the Oxygen Network. Mario currently resides in Los Angeles with his longtime fiance Courtney Mazza and their daughter, Gia. QVC’s parent, Liberty Interactive Corp., will release its fourth-quarter earnings Feb. 23 at 11:00 a.m., officials said Wednesday. Greg Maffei, Liberty Interactive’s President and CEO, will host the call and discuss the company’s financial performance. Replays of the conference call can be accessed through 2 p.m. March 1, by dialing (888) 203-1112 or (719) 457-0820 plus the passcode 1032754#. In addition, the fourth quarter earnings conference call will be broadcast live via the Internet. All interested participants should visit the Liberty Interactive website at http://www.libertyinteractive.com/events to register for the web cast. Links to the press release and replays of the call will also be available on the Liberty Interactive website. The conference call and related materials will be archived on the website for one year. HSN will release its fourth quarter and fiscal 2011 results Feb. 23 at 8 a.m., the home shopping channel said Tuesday. CEO Mindy Grossman and Judy Schmeling, executive vice president and chief financial officer, will hold a conference call at 9 a.m. to review the results. Those interested in participating in the conference call should dial 877-307-0246 or 224-357-2394 at least five minutes prior to the call. There will also be a simultaneous audio webcast available via the company’s website at http://www.hsni.com. A replay of the conference call can be accessed until March 8 by dialing 855-859-2056 or 404-537-3406, plus the pass code 42849184 and will also be hosted on the company’s website for a limited time. We’re sick and should be in bed asleep by now, it’s 2:30 a.m. after all, but we can’t sleep. Tuesday is a jewelry geek’s delight: QVC is doing its California Gold Rush day while HSN is doing Designer Jewelry Day. “Reset the gold standard during today’s 25th Annual California Gold Rush Sale,” QVC said on its website. It’s your golden opportunity to discover style and savings on a stunning assortment of 14K gold jewelry. Hurry for best selection and savings. It’s true, all is not perfect. Before the price of this special metal soared, the Gold Rush was a 24-hour event on QVC live. Now, it’s just 13 hours of on-air programming, with the rest of the goodies posted online. Not cool. HSN has a Studio Barse bronze ring with either a turq, coral or tiger’s eye stone. No. 1, we don’t care if the prices of silver and gold have skyrocketed, we have the bronze and copper pieces that have replaced it, especially on HSN. Now we have bronze Studio Barse and Nicky Butler and Hilary Joy jewelry in those metals. “Copper is the new rose gold,” Hilary Joy’s chief said on-air. Another pet peeve: Studio Barse boasts that it uses real turquoise and coral. It’s true, it’s real. But it is “compressed” turq and coral, in other words, small bits of those materials are put together and scrunched into one piece. That to us is less of a value, less desirable, than using a solid piece of turquoise in a ring. One of our favorite jewelry designers, that master of crosses Dallas Prince, has bounced back to ShopNBC after a stint at HSN. Prince, a gracious and classy blonde, had her first show back in Minnesota Thursday, for the No. 3 home shopping network’s Designer Day. HSN is having its designer jewelry day Tuesday, with a TS from Studio Barse. We know it’s a ring, but we hope it’s not in bronze! With the price of silver soaring, we are finding it better to find sterling pieces at TJ Maxx (although its selection has diminished) and local shops — such as Eastern Gifts and Dem Two Hands in Montclair — than on home shopping networks. The prices of these mom-and=pop shops are higher than they used to be, but they carry lovely handcrafted silver and gemstone jewelry. In light of the tragic ship wreck in Italy, we think that the fact that Jewelry Television went forward with the debut of its “Titanic Jewelry Collection” last week was beyond bad taste. As one of our astute posters noted, JTV premiered this collection as divers were still hunting for survivors, and victims, of the Italian cruise line crash. Do the folks at Jewelry Television have gallows humor? That’s what we wonder every time we see, and cringe at, the network’s promos for its new “Titanic Jewelry Collection.” The pieces have a vintage feel, and look pretty. Of course, there’s a big blue heart in the collection. But that name! For four magical days, the Titanic’s elite passengers reveled in every modern luxury known at the time. Jewelry of that time was depictive of the Art Nouveau and Edwardian eras. Art Nouveau jewelry was influenced on naturalism, involving unusual designs within a symmetrical frame encompassing foliage, leaves, enamel, pearls, crystals and gemstones. Edwardian designs included more formal jewelry; tiaras, brooches, rings, pendants, earrings, bracelets and sautoir necklaces. Many set with brilliant gemstones, diamonds, crystals and pearls. But what marketing whiz thought it would be a good idea to name the line after one of the worse disasters at sea ever? The jewelry pieces have names, as well, of what would appear to be passengers on the ill-fated 1912 voyage. We think. Actually, we’re not quite sure if they were real people, or just made up by JTV. For example, here is what JTV has to say about its Eleanor Social Butterfly Brooch. Eleanor Widener first class passenger of the Titanic. Eleanor and her husband and aren’t the richest passengers on board–that honor goes to John Jacob Astor–were not far behind him. Her husband is the heir to the largest fortune in Philadelphia and, with that, comes a certain social responsibility. Consequently, we were very well known for our lavish parties and our enviable guest lists. Once aboard the Titanic, we will make it a point to meet the right people and invite them to our private parties. Speaking of being social…you might find Eleanor wearing this social butterfly brooch while waiting to chat with her fellow passengers. Launches indeed. That’s a real knee slapper. Sorry we haven’t been blogging as much as we should be. The day job is often a day job and night job. So we’ll try to catch-up here. QVC designer Isaac Mizrahi, 50, and his boyfriend Arnold Germer have gotten hitched, officially. During an appearance on “The Wendy Williams Show,” Mizrahi said he and Germer had gotten married. We didn’t see “Anything Goes,” but looking at the product lineup, not much went. Here’s the spicy linuep of goods that Rick and Shawn were selling: a battery-operated callus remover; a Rowenta steam iron; Billy Blanks Ultimate Workout DVD; microfiber dusters; a storage set; a hair flat iron; a ceramic fireplace heater; and an air purifier. Whoppee! Wow, anything goes, ha? A callus remover and a Rowenta? Rick and Shawn must have been having a wild old time. We’re sorry we missed those microfiber dusters. We can only hope that Robertson’s “show” is better. Here is what she has said on Facebook about it. Guess what?! This February, a brand-new show is coming to QVC…”The Lisa Robertson Show”! I’m really excited about it. But it’s not just because I’ll be your humble host. Every Friday night, we’re going to give you your own personal magazine/ trunk show/ private party, (all good things 🙂 We’re bringing you amazing ideas and we’ll show you how to make them your own. We’re sitting down with your favorite designers and introducing you to some up-and-coming trendsetters. More details to come in the coming weeks. Robertson, by the way, is on a two-week vacation to India and Dubai. Finally, who in their right mind would buy a diet or nutrition product from Kirstie Alley, whose weight has fluctuated in 100-pound swings. Yet QVC is hawking her diet program. “I can assure you that if you follow this program, you’ll get healthier, lose weight, and not be ‘annoyingly’ hungry,” Alley said on QVC’s website. Jump-start your weight loss with this fun and engaging program: Kirstie Alley’s Organic Liaison. A 30-day supply of the healthy elixir and supplement duo provides the support your body needs, morning and night. The Body Game book guides you through the goals, barriers, rules, and rewards you may encounter as you strive to achieve your goals. From Organic Liaison. We have to take a pass on that one. You are currently browsing the Homeshoppingista's Blog By Linda Moss blog archives for January, 2012.